Typeface demo sheets, eye charts and logos come together to create a lush, idiosyncratic catalogue of visual ephemera as chosen by Rothenstein, a designer, and Gooding, an art critic and curator. They present forgotten modernist lettering, from Italian Futurist and Russian Constructivist graphics to Czech Karel Teige's 1926""living poem"" (of typeface combined with illustrative photography of a dancer);""The Antifascist Schoolbook,"" a rebellious, late 1930s graphic text against Spain's General Franco; and advertisements for everything from tea to caviar. Each large page is striking in its muted, silkscreened colors, and the book itself is beautiful, with rounded corners, yellow edges and green splotchy endpapers. Very little text intervenes, with only small introductions to the five chapters. 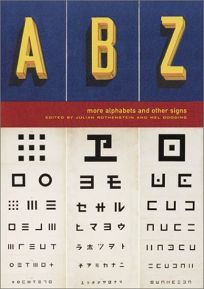 Gooding suggests in his introduction,""There is indeed something quite magical about the look of the alphabet: it has to do with its infinite capacity to change shape and style, to express purpose and suggest mood, to be formal and informal, elegant and ugly, classical and romantic, delicate and robust."" Rescued from among thousands, the alphabets here provide us with the subtitle's""More,"" and bear out that infinitude beautifully.